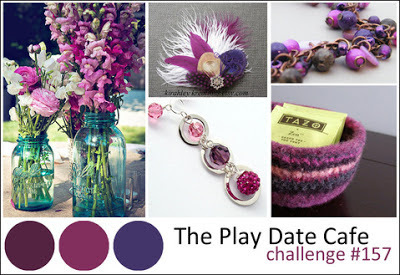 It's time for a new color challenge at The Play Date Cafe! I love purples and I think this week includes the most shades of purple I've ever seen in a PDC Challenge!! This weeks colors are Plum, Fuchsia, and Wisteria. 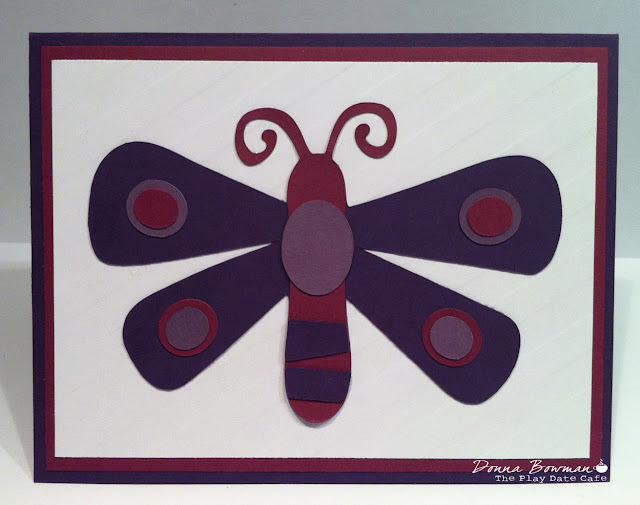 I don't have a lot of patterned paper in these colors, so I went to my stash of Stampin' Up colors and ended up using Perfect Plum, Elegant Eggplant and Rich Razzleberry. I also used a texture plate from PTI on the white card stock. Then, I did something I rarely do, I pulled out the Cricut. I made this cute butterfly that I got from a cartridge called A Walk in My Garden. It was so big, I just left off the sentiment so I could use it for almost any occasion. I really hope you are as excited about these colors as I am and that you will join us this week. I can't wait to see what you come up with using these fun and different colors! Our sponsor this week is Simon Says Stamp. Totally too sweet Donna! Great use of the challenge colours! Love that funky purple butterfly! Great interpretation of the challenge. I love purple but it's so hard for me to craft with it!